Recent updates bode well for the relevance of laser therapy in retina. • Since the introduction of anti-VEGF therapy, laser photocoagulation has taken a back seat in the management of some retinal diseases. • Nonetheless, lasers as a modality of treatment for a number of vitreoretinal disorders continue to evolve in terms of management protocol, innovations, and ever-expanding indications. • With the advent of micropulse and nanopulse laser technologies, laser therapy may be regaining importance. Gas (argon, krypton) and liquid (tunable dye) lasers were subsequently introduced, but these did not remain practical options due to the bulky nature of the equipment and the expense of upkeep. Semiconductor lasers were introduced in the 1960s,2,3 but early versions were purely infrared and had limited applications. These devices did not gain popularity until recently, when visible light wavelength lasers were introduced. The ETDRS established laser photocoagulation as standard of care for management of diabetic retinopathy.6 Since the introduction of anti-VEGF therapy, laser photocoagulation has taken a back seat in management of diabetic macular edema (DME). However, laser photocoagulation still has a significant role in the treatment of a number of retinal diseases and can be considered a standard of care. In this article we describe current indications for laser photocoagulation and recent updates in this field. Panretinal photocoagulation (PRP) reduces the hypoxic load and promotes inner retinal oxygenation. The efficacy of PRP was demonstrated in the ETDRS and the Diabetic Retinopathy Study.6,7 Treatment of proliferative diabetic retinopathy (PDR) remains the most common indication for photocoagulation to date. Recently, the Diabetic Retinopathy Clinical Research Network (DRCR.net) Protocol S found anti-VEGF monotherapy to be as effective as conventional PRP.8 However, clinical and economic advantages still make PRP the preferred treatment choice in many real-life situations. Figure 1. Baseline color photograph (A) shows subretinal fluid (arrowheads); leakage (arrow) is seen on fluorescein angiography (B, arrow) and neurosensory detachment on SD-OCT (C). One month after micropulse laser treatment, no subretinal fluid is seen on 0217color photograph (D) and no active leak on angiography (E). SD-OCT showed no fluid at 1-month (F) and 6-month follow-ups (G). The Branch Vein Occlusion Study showed the efficacy of grid laser in macular edema secondary to branch retinal vein occlusion (BRVO),11 and the Central Vein Occlusion Study showed the benefit of scatter photocoagulation in the management of neovascularization in central retinal vein occlusion (CRVO) for prevention of glaucoma.12 Anti-VEGF therapy has since become the first choice of treatment for these indications. However, macular or peripheral laser to ischemic areas may still have a role in recalcitrant cases. Figure 2. A 67-year-old man presented with complaints of distortion in his left eye. On examination, his BCVA was 20/30 with small intraretinal hemorrhage (A, arrow) close to the fovea. Fluorescein angiography showed early hyperfluorescence with late leakage (B, C) with presence of subretinal fluid and dragging of inner retinal layers with pigment epithelial detachment on SD-OCT (D). Diagnosis of retinal angiomatous proliferation was made, and patient received two monthly injections of intravitreal ranibizumab (Lucentis, Genentech) plus laser photocoagulation to the focal leak. BCVA improved to 20/20 and subretinal fluid resolved (E). The patient maintained 20/20 BCVA with no recurrence at his most recent follow-up visit at 18 months (F). Lasers have long been used for management of focal leaks in the treatment of persistent cases of nonresolving central serous chorioretinopathy (CSCR).13 The introduction of micropulse laser has allowed clinicians to manage not only extrafoveal leaks but also subfoveal leaks, along with areas of diffuse RPE dysfunction, quite successfully (Figure 1). Micropulse laser can be considered an alternative to photodynamic therapy in eyes with chronic CSCR with or without subfoveal leaks. Figure 3. Fundus photograph shows subhyaloid hemorrhage abutting the fovea (A). Laser marks are planned using Navilas laser (OD-OS) at the lower portion of the subhyaloid hemorrhage (B). Hyaloid membrane opening is seen (C). After a few minutes, subhyaloid hemorrhage clearing of the macular region (D). In exudative retinal vascular disorders such as Coats disease,15 retinal capillary hemangioma,16 or retinal artery macroaneurysms,17 laser photocoagulation can be used to directly close the leaking vessels by promoting thrombosis. Retinochoroidal neovascular diseases, such as extrafoveal choroidal neovascular membrane,18 extrafoveal retinal angiomatous proliferation lesions (Figure 2),19 and polyps in polypoidal choroidal vasculopathy,20 can be addressed with thermal photocoagulation efficiently and with great results. In peripheral retinal ischemic retinopathies such as vasculitis, familial exudative vitreoretinopathy, and retinopathy of prematurity, laser can help to reduce the hypoxic load on the retina and prevent devastating complications. For vasoproliferative retinal tumors,21 angiomas, etc., laser photocoagulation can promote closure, much as described above for other neovascular complexes. Laser shock waves can be used in miscellaneous indications, such as to disrupt the hyaloid interface in eyes with subhyaloid hemorrhages (Figure 3) or to clear the center of the visual axis in dense posterior capsular opacifications. Endpoint Management is a program developed for the 577nm Pascal laser (Topcon) that allows mapping values of tissue damage based on computational modeling to a linear scale of laser energy, relative to a visible titration level. The titration algorithm for Endpoint Management begins by defining the laser power at 20 ms pulse duration to produce a barely visible burn within 3 seconds after the laser pulse. With this energy level defined as 100%, all other pulse energies are expressed as a percentage of this titration threshold. Although the coagulation threshold will vary from patient to patient, a 50% or 30% setting on Endpoint Management will always correspond to half or a third of the titration threshold energy. Tissue damage at an energy level of 30% is limited to a single RPE cell in the center of the 200-µm spot. With Endpoint Management, some spots in a grid treatment pattern can be set at 100% (or above) to mark the location of the subvisble treatment with an immediately visible reference. This allows the user to adjust power to maintain the same ophthalmoscopic visibility grade throughout the fundus. It thus provides a fairly reproducible approach to subvisible retinal laser therapy, possibly resulting in reduced dependence on injections. Subthreshold micropulse laser is thought to limit damage to adjacent tissue. Rather than maintaining the same degree of energy throughout exposure time, laser energy is delivered in ultrashort (microseconds) pulses with adjustable on and off times. The length of these pulses must be shorter than the thermal relaxation time of the target tissue (the time required for heat to be transferred away from the irradiated tissue). Micropulse laser thereby induces a temperature rise insufficient to cause ancillary damage to surrounding retinal tissue. Retina Regeneration Therapy (2RT; Ellex Medical Lasers) is a subthreshold laser modality using a 532-nm laser to produce 3-ns pulses. These nanosecond pulses are purported to stimulate renewal of the RPE. 2RT combines subthreshold with micropulse laser protocols. This nanosecond laser, using a speckle-beam profile, provides a wider therapeutic range of energies over which RPE treatment can be performed without damage to the apposed retina, as compared with conventional laser.24 The use of lower energy levels is meant to cause sublethal injury to targeted RPE, rather than destroying it and leading to cytokine release by recovering RPE cells. 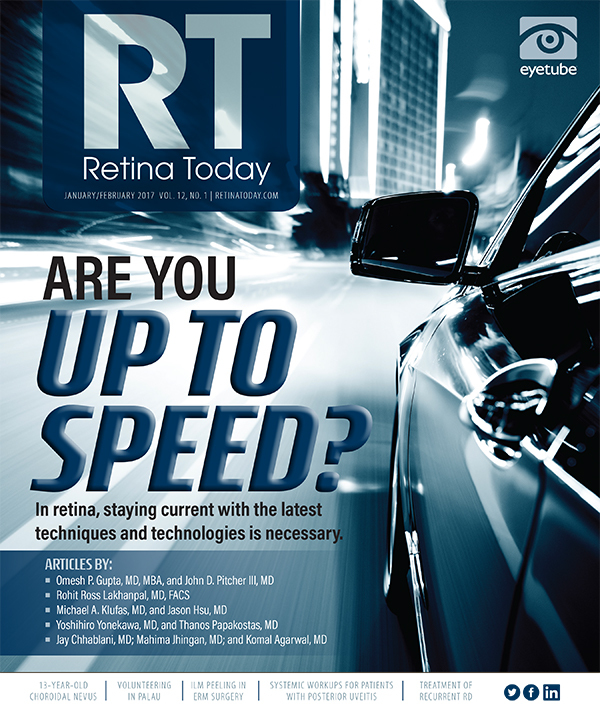 Lasers as a modality of management for retinal diseases continue to evolve in terms of management protocol, innovations, and ever-expanding indications. Laser therapy remains an integral component of conservative management in a number of vitreoretinal disorders. With the advent of micropulse and nanopulse laser technologies, laser therapy may be regaining its importance, with expanding indications in the management of many retinal diseases. 1. Meyer-Schwickerath GR. The history of photocoagulation. Aust N Z J Ophthalmol. 1989;17(4):427-434. 2. Moriarty AP. Diode lasers in ophthalmology. Int Ophthalmol. 1993;17(6):297-304. 3. Balles MW, Puliafito CA. Semiconductor diode lasers: a new laser light source in ophthalmology. Int Ophthalmol Clin. 1990;30(2):77-83. 4. Stefansson E. The therapeutic effects of retinal laser treatment and vitrectomy. A theory based on oxygen and vascular physiology. Acta Ophthalmol Scand. 2001;79(5):435-440. 5. Matsumoto M, Yoshimura N, Honda Y. Increased production of transforming growth factor-beta 2 from cultured human retinal pigment epithelial cells by photocoagulation. Invest Ophthalmol Vis Sci. 1994;35(13):4245-4252. 6. [no authors listed]. Early photocoagulation for diabetic retinopathy. ETDRS report number 9. Early Treatment Diabetic Retinopathy Study Research Group. Ophthalmology. 1991;98(5 Suppl):766-785. 7. [no authors listed]. Photocoagulation treatment of proliferative diabetic retinopathy: the second report of Diabetic Retinopathy Study findings. Ophthalmology. 1978;85(1):82-106. 8. Writing Committee for the Diabetic Retinopathy Clinical Research Network; Gross JG, Glassman AR, Jampol LM, et al. Panretinal photocoagulation vs intravitreous ranibizumab for proliferative diabetic retinopathy: a randomized clinical trial. JAMA. 2015;314(20):2137-2146. 9. Luttrull JK, Musch DC, Spink CA. Subthreshold diode micropulse panretinal photocoagulation for proliferative diabetic retinopathy. Eye (Lond). 2008;22(5):607-612. 10. Chen G, Tzekov R, Li W, et al. Subthreshold micropulse diode laser versus conventional laser photocoagulation for diabetic macular edema: a meta-analysis of randomized controlled trials. Retina. 2016;36(11):2059-2065. 11. [no authors listed]. Argon laser photocoagulation for macular edema in branch vein occlusion. The Branch Vein Occlusion Study Group. Am J Ophthalmol. 1984;98(3):271-282. 12. Finkelstein D. Laser therapy for central retinal vein obstruction. Curr Opin Ophthalmol. 1996;7(3):80-83. 13. Nicholson B, Noble J, Forooghian F, Meyerle C. Central serous chorioretinopathy: update on pathophysiology and treatment. Surv Ophthalmol. 2013;58(2):103-126. 14. Kovacevic D, Loncarek K. Long-term results of argon laser retinal photocoagulation for retinal ruptures [article in Croatian]. Acta Med Croatica. 2006;60(2):149-152. 15. Koh YT, Sanjay S. Successful outcome of adult-onset Coats’ disease following retinal laser photocoagulation. Oman J Ophthalmol. 2013;6(3):206-207. 16. Singh AD, Nouri M, Shields CL, et al. Treatment of retinal capillary hemangioma. Ophthalmology. 2002;109(10):1799-1806. 17. Speilburg AM, Klemencic SA. Ruptured retinal arterial macroaneurysm: diagnosis and management. J Optom. 2014;7(3):131-137. 18. Bhatt N, Diamond JG, Jalali S, Das T. Choroidal neovascular membrane. Indian J Ophthalmol. 1998;46(2):67-80. 19. Johnson TM, Glaser BM. Focal laser ablation of retinal angiomatous proliferation. Retina. 2006;26(7):765-772. 20. 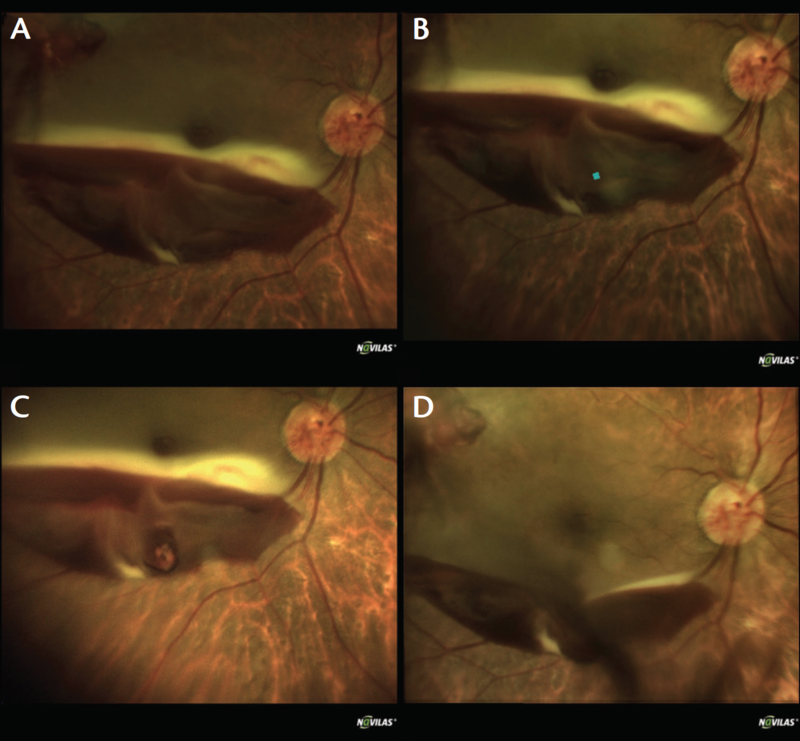 Rishi P, Das A, Sarate P, Rishi E. Management of peripheral polypoidal choroidal vasculopathy with intravitreal bevacizumab and indocyanine green angiography-guided laser photocoagulation. Indian J Ophthalmol. 2012;60(1):60-63. 21. Bertelli E, Pernter H. Vasoproliferative retinal tumor treated with indocyanine green-mediated photothrombosis. Retin Cases Brief Rep. 2009;3(3):266-271. 22. Moisseiev E, Moisseiev J, Loewenstein A. Optic disc pit maculopathy: when and how to treat? A review of the pathogenesis and treatment options. Int J Retina Vitreous. 2015;1:13. 23. Berger JW. Thermal modelling of micropulsed diode laser retinal photocoagulation. Lasers Surg Med. 1997;20(4):409-415. 24. Wood JP, Plunkett M, Previn V, et al. Nanosecond pulse lasers for retinal applications. Lasers Surg Med. 2011;43(6):499-510. 25. Muqit MM, Young LB, McKenzie R, et al. Pilot randomised clinical trial of Pascal TargETEd Retinal versus variable fluence PANretinal 20 ms laser in diabetic retinopathy: PETER PAN study. Br J Ophthalmol. 2013;97(2):220-227.